I’d like to take a few seconds to tell you about our NEW and DYNAMIC Industrial Supply solutions web site. We offer industrial ladders, lockers, and cafeteria tables for employee areas along with other selected factory supplies and equipment made in the USA. We also inventory Galaxy Cargo Lifts and install these units. We are making available to our internet customers direct shipments from our suppliers without the costs of warehousing and DOUBLE shipping! We understand that a customer placing orders on some items may need a professional and courteous person on the telephone to help guide inquiries into a business decision. So we don't offer a 'Shopping Cart' for placing important orders on the web. What size work platform is best for your warehouse? We have expert advice! What special color arrangement can be made on my cafeteria seating order? What are my OSHA requirements in California? Can I simply receive a quote by phone without giving out my personal info on the internet? Can I give you a PURCHASE ORDER? What is the best time to drop off your product? We have over 75 years of combined Material Handling & Supply Experience in our specialists. Certain Products are Manufactured by others and are PRIVATE LABELED for Us. Special Items: Special items built to your specifications may require a 1/2 deposit before starting. Returns & Cancellations: Any item that is returned must be a stock off the shelf item. 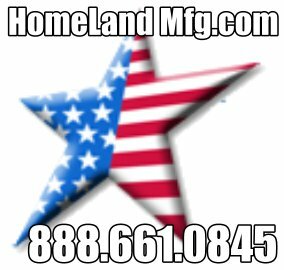 HomeLand Manufacturing must be notified within 7 calendar days from receipt of goods if an item is requested to be returned. Item must be in "as new" condition and you must receive a return authorization (RGA), that is required by manufacturer before item can be shipped back. Same day shipments are non-cancelable and non-refundable for any reason. Special Ordered Items are non-cancelable & non-returnable for any reason. Return freight is paid for by the buyer and a restocking fee will be added (percentage varies by product). Credit Card Orders: Cancellation will incur a six percent (6%) credit card fee deducted from any refund due and owing. Cancellation fee of $50 for any standard product cancelled after confirmation of order. (for processing of paperwork). Always inspect your shipped items as ordered and for damages before signing a freight delivery receipt. Often a freight claim can not be made after your inspection and the fright driver leaves. Shipping Over Seas Policy: All products exported must be paid for in advance in US currency. Freight Carriers: Please remember that a freight carrier is an independent contractor and you retain ownership of goods upon freight point of pick-up. Make sure your measurements are correct, be aware of local OSHA requirements, etc. before placing your orders. Look over your delivery making sure it is CORRECT & UNDAMAGED before signing for the fright shipment.